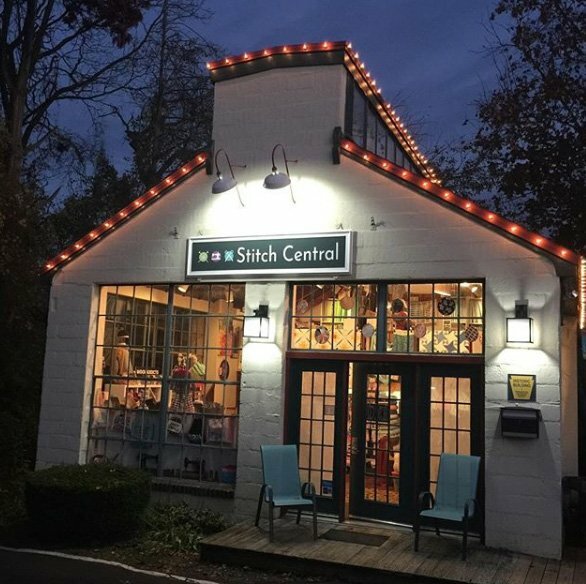 Stitch Central is a quilting, fabric and yarn store started in 2018 by Cybele Perry and Danielle Gallagher. We wanted to create a homey space for quilters, knitters, sewists and crafters and to stock beautiful & contemporary supplies. We found our perfect home in Huntingdon Valley, in a beautiful & unique building with a very cool history. Dating from the 1920's, our little glass house was built for famed stained glass artist, Laurence Saint. He was commissioned by John Pitcairn, Jr to create the stained glass for the Bryn Athyn Cathedral, and when he was unable to find the exact type of glass he required for his project, Mr Pitcairn build him our place as his glass foundry. He went on to do the windows in the Washington National Cathedral, but before all of that, Laurence Saint was the brother in law of the people who owned Danielle's house in Wyncote, and lived in the house across the street from where she lives now. In the 10th grade Cybele sewed for herself a cornflower blue dress with little cows on it. She loved it and her classmates there after called her "that girl with the cow dress". Cementing her status of slightly weird Cybele then joined the backstage theater club and went on to spend the next 24 years creating props and scenery for shows and events. All the while quilting and sewing for her family and craft shows. Having reached the dizzying heights of event upper management in a windowless cubicle she looked around one spring day and decided to chuck it all. And here she is! Danielle is a Canadian who moved to Pennsylvania from Indonesia in 2017. Confused yet? She lived overseas with her American husband for a decade before settling in the US. While abroad, she taught quilting classes and managed a quilting/fabric/yarn shop in Dubai, then spent three years soaking up textile traditions in Indonesia. She grew up sewing and knitting, loves quilting, and designs quilts and knitting patterns.